This book provides a comprehensive overview of behavioral interventions to prevent HIV-AIDS risk-related behaviors. It synthesizes the empirical literature on individual, group, and community-level interventions and provides an objective and detailed assessment of intervention outcomes. Factors associated with behavioral risk for HIV transmission, theories of HIV risk behavior change, and the state of HIV prevention technology transfer are also reviewed. Additionally, behavioral interventions for adolescents and adults of diverse ethnic and sexual backgrounds are discussed with respect to each intervention type. Although the focus is on sexual risk reduction, interventions for sexual behavior of substance abusing populations are also covered. "Kalichman's Sourcebook is a truly excellent resource for anyone involved in HIV prevention." "This is a must-read volume for professionals who conduct, or are planning to conduct, HIV prevention programs. Of exceptional importance is the comprehensive nature of the book's focus, including individual-, group-, and community-level HIV prevention interventions. The author provides lots of helpful, practical guidance for implementing effective HIV prevention interventions, and in a manner that is thoroughly up-to-date. An important and very useful guide." "How refreshing to read Preventing AIDS: A Sourcebook for Behavioral Interventions, a book that begins with the best scientific evidence available and uses this information to describe and assess HIV prevention interventions. This book is mandatory reading for all health professionals, elected and appointed public officials and others responsible for formulating public policies about AIDS, and members of community planning groups dealing with AIDS/HIV. No one should be allowed to express an opinion about what is wrong with HIV prevention without first reading this important book. Professor Kalichman knows what he is writing about and provides a great service by explaining behavioral phenomena so clearly and crisply. This book will be an indispensable tool for improving comprehensive health planning and promotion of HIV prevention in the United States and elsewhere." "Once again, Seth Kalichman demonstrates his ability to distill the essential truths from the rapidly expanding field of HIV prevention. 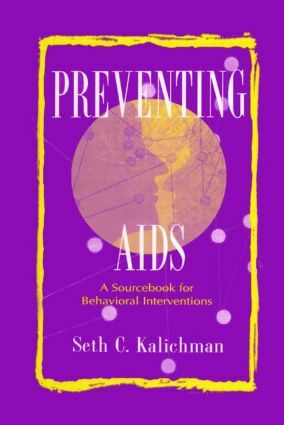 With Preventing AIDS: A Sourcebook for Behavioral Interventions, Kalichman provides a comprehensive, scholarly, and highly accessible accounting of HIV prevention theory, practice, research, and policy. Kalichman is an 'insider,' a well-qualified scientist and author, who brings his considerable experience to explain the big picture with an engaging style. Students, prevention workers, educators, and experts will profit from and enjoy this informative work." "At last, a book that takes nearly twenty years of research and studies and knits them together into a single comprehensive volume. Whether you are a researcher, community AIDS worker, HIV prevention specialist, or new student in the field, Dr. Kalichman's very readable work will save you hours of confusing searches. In a field rife with conflict, here is a clear calm voice expertly setting out what we know and what remains unknowable. Close your overstuffed file cabinets, move away from the overheated photocopier, and pick up this book!" Contents: Preface. HIV Risk. Risk Reduction. Selected Topics in Evaluating Interventions. Individual-Level Interventions. Small Group Interventions. Community-Level Interventions. Technology Transfer.